Good points!!! talking loudly used to drive me insane, esp when the chatter wasn't uni related which it usually wasn't. I need basically silence to work so people chatting makes me so annoyed and I can't concentrate, especially when Im in a quiet area! I hate it when people talk in the library. I always book a private room when I have group work to be considerate to others studying alone! And any kind of noise can distract me so open sweets and crisps before you enter the library! We're not even allowed to eat in our library now because it's just be redone but I need food! We're not allowed to eat hot meals in the library but we can have cold things and snacks, and I must admit I do eat in the library but I try and pick quiet foods haha! My university's library had a STRICT no food policy. There were vending machines, a cafe, and a small eating area on the ground floor and that was the only place you could eat or drink. And no books were allowed in that space. I'm glad though - no one wants sticky fingers or crumbs on their study books! 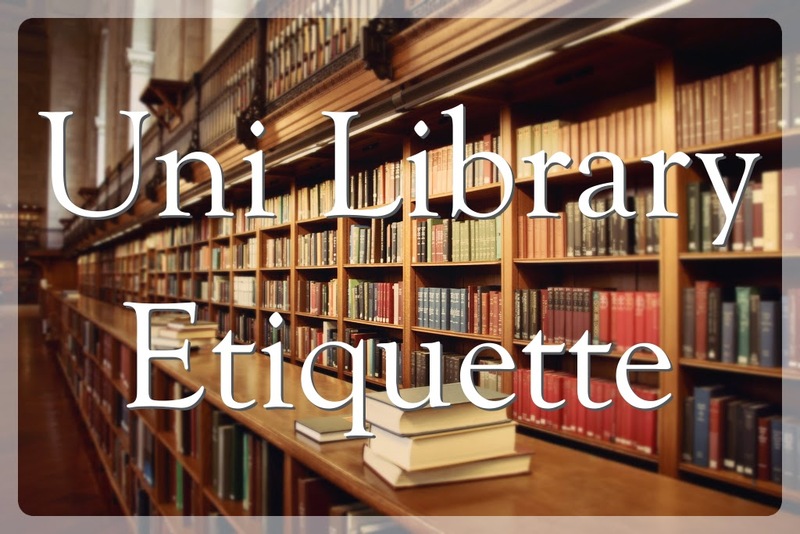 Talking or taking calls in the stacks or study areas is just the height of rudeness. I can't believe people actually do that! Thats pretty strict but I guess it makes sense, keeps the ground floor a more social area so people on other floors can just study. And yeah people on the phone is SO rude! I must admit I have chatted in the library before but now I'm a lot more conscious of it and try to keep talking to a minimum, because i know how frustrating it is! I laughed so much at this! Every single one of them should be abided by and I may or may not print this out 1,000 times and put it around the 5 libraries on campus. The sweets thing is hard. I usually get Haribo and then rip the pack completely open so I'm not rustling the bag every time I have one but then I have to eat the entire pack and that's pretty bad. It's a fab excuse to eat a whole bag though! Hahaha, printing it out sounds like such a good idea, but wow 5 Libraries! thats a lot, but at least it means theres always somewhere to work I guess. And of course you've gotta eat the whole bag, can't do work without some form of snack! !